Most of the methods employed for yield estimation are destructive, labour and time demanding, or very expensive. This method uses inexpensive RGB images taken by a commercial camera at field. A software was developed in Matlab to asses leaf area and yield using a supervised classifier based on the Mahalanobis distance. 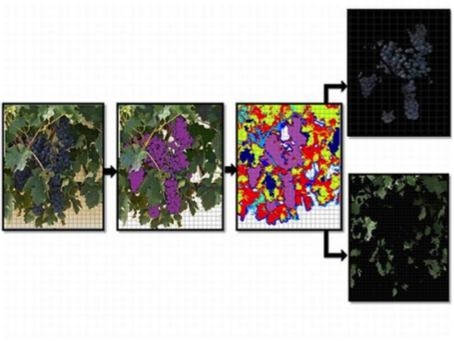 The method automatically processes sets of images, and calculates the areas (number of pixels) corresponding to seven different classes (Grapes, Wood, Background, and four classes of Leaf, of increasing leaf age). Each one is initialized by the user, who selects a set of representative pixels for every class in order to induce the clustering around them. The segmentation results showed a performance of 92% for leaves and 98% for clusters, and allowed to assess the grapevine’s leaf area and yield with R2 values of 0.81 (p < 0.001) and 0.73 (p = 0.002), respectively. 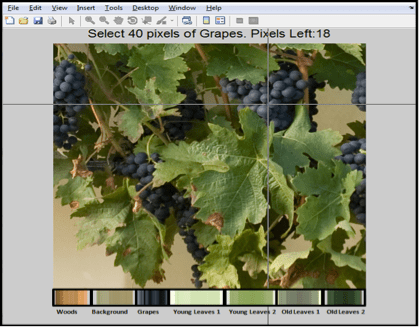 This methodology, which operates with a simple image acquisition setup and guarantees the right number and kind of pixel classes, has shown to be suitable and robust enough to provide valuable information for vineyard management. This paper was published in the Special Issue “Sensor-Based Technologies and Processes in Agriculture and Forestry” of the open access journal “Sensors” (IF: 1.739 (2011); 5-Year Impact Factor: 2.060 (2011)).